Summer is a great time to take a break and catch your breath as a homeschooler. However, it’s also a great time to focus on Summer reading goals. We are trying to make more of an effort to focus on time for Summer reading. Not only is it fun to participate in the Summer reading programs, it is also a great way to work on reading skills in a fun way. This Summer R has made it her goal to finish the Harry Potter series. 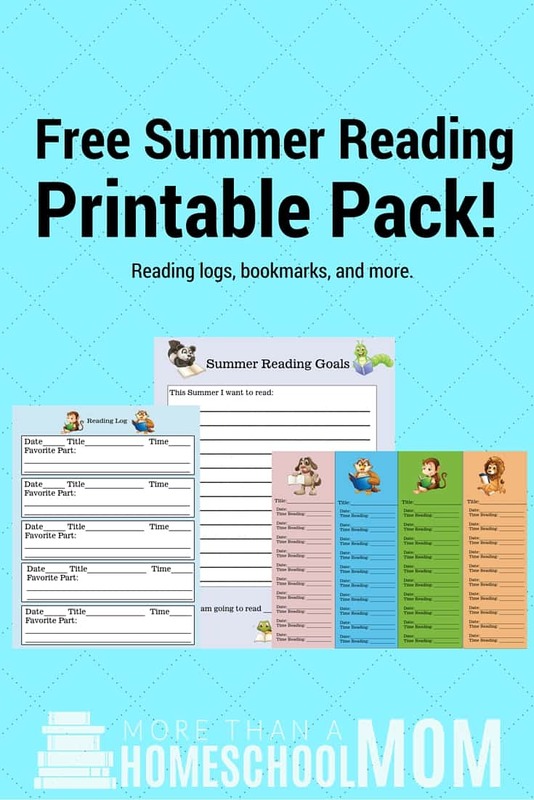 I put together this fun Summer reading printable pack for her to keep track of her reading. I also put it together for you to enjoy. I have included reading logs in black and white or in color based on what you would prefer. On each reading log your child can write down their title, date read, and reading time. These bookmarks are a fun way to keep up with your reading time while on the go. Each bookmark has the title spot on the top as well as many lines to write the date and amount of time spent reading. I recommend printing these on card stock or construction paper as printer paper may not survive multiple days of reading. This reading log has animals you can cut out and paste on each square. Each square will equal one hour of reading time. This is great for visual learners. Whether you want to reward your reader at the end of the week or the end of the year, I have included just the reward for you. Simply write in the appropriate places to personalize your certificate. Looking for ways to make more of Summer Reading? Check out some of my resources and book ideas below!